If you have ever been a college student (or raised one), you know how fast the costs of an education add up. First you have soaring tuition prices, room and board, out-of-state fees, and of course the cost of textbooks. Textbooks are costly, and for the majority of college students the added expense makes the journey of education even more arduous. It makes sense that students are cutting costs wherever they can. There are only so many scholarships and grants available, but all students can now opt out of buying brand new textbooks. Instead, many are choosing to buy used copies or rent their books through Amazons extensive textbook program. What does this mean for textbook publishers? Let’s find out. Students spend upward of $500 each semester on books and other course materials, supporting a massive industry. Before the rise of textbook rental programs, the majority of students had no choice but to purchase new books. Now, that’s simply not the case. Used textbooks and rental services are substantially less expensive than a new textbook. Take the 11th Edition of Campbell Biology. A new textbook will set you back a whopping $259.60. A used rings up at $166.55. Renting the very same book is a mere $21.89. 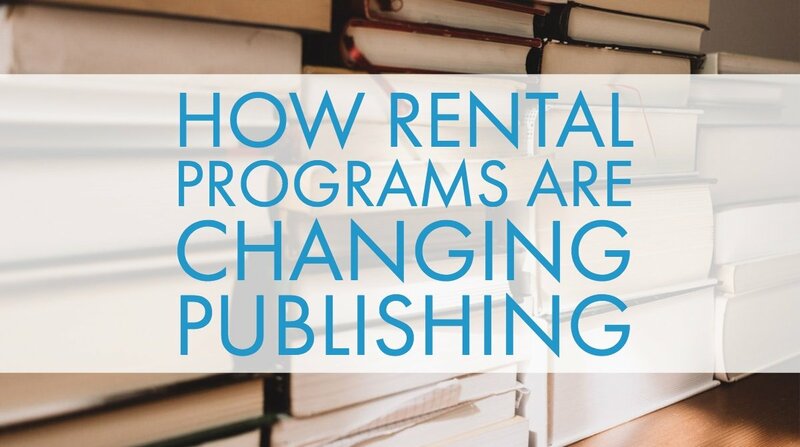 Students have naturally taken to these rental programs like moths to a lightbulb. This change has the potential to result in millions of dollars lost in sales. To understand how we can combat this shift as publishers, we have to study the habits and needs of college students in greater depth. The growth of the textbook-rental market has been steadily increasing since the mid-2000s. Around 10% of all textbooks were rented in 2012, vs 25% of textbooks in 2014. Today, that figure is has risen to around 50%. While this may seem ominous for textbook publishers, it doesn’t have to be. Around 25% of textbooks sold are custom publications. These usually get updated annually, which mandates the purchase of new books. Similarly, some textbooks come with workbooks that don’t come with used or rented books. Textbooks available for rental often don’t include material for advanced elective courses or other highly specific fields with a relatively small target audience. In all likelihood, this implies that the textbook rental market is just about maxed out. However, if you think this means publishers can breathe easy, think again. Whenever students are given the option to acquire rented books, publishers continue to lose out on new book sales. Every used book that goes on the market equates to a lost sale. The outlook on textbook sales isn’t the most encouraging. It’s unlikely to see any significant improvement in new textbook sales. It’s simply no longer the most attractive option. In most cases, the phrase “fight fire with fire” advice is ill-advised advice. When technology steals your sales, however, the best way to fight back is by furthering technology of your own. Nearly all young adults now own a smartphone- 94%! The market for online textbooks will continue to grow as new generations of tech-savvy youths enter the picture. The more we can offer these new students with digital publications, the greater success we are likely to achieve. This means more interactivity, consistently updated material, further opportunities for online connection and educational assistance, and ongoing learning assessments. Online learning offers flexibility that traditional textbooks simply can’t. Their interactive elements keep the modern learner engaged and focused, improving retention rates. The opportunity to constantly track progress and pinpoint areas of study that need more attention or clarification is unmatched by a traditional textbook. We can’t bring back the popularity of new hard-copy textbooks with so many big-name rental programs available. The good thing is, we don’t have to! Instead of mourning lost sales, let’s turn out focus to giving 21st century students what they really want: New, better, and revolutionary online material. Whatever your publishing goals, MyEcontentFactory can help make them happen.